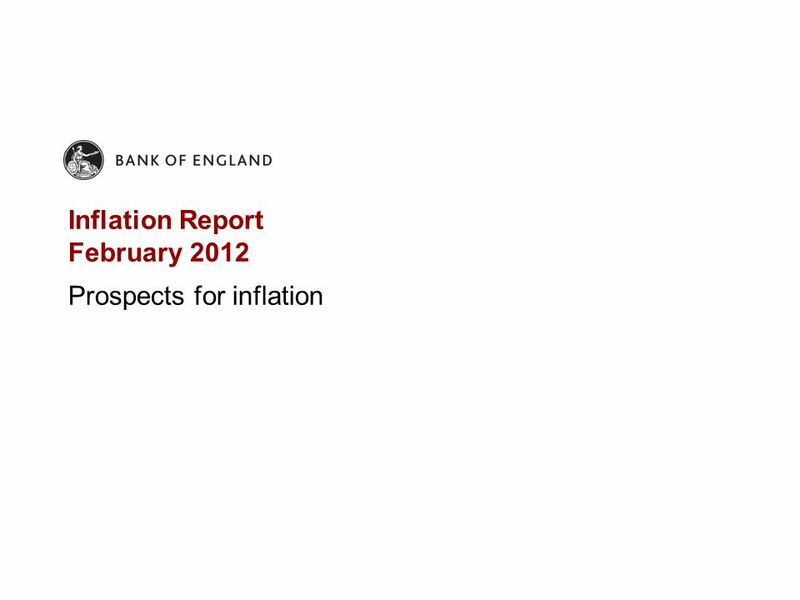 Inflation Report February 2012 Prospects for inflation. 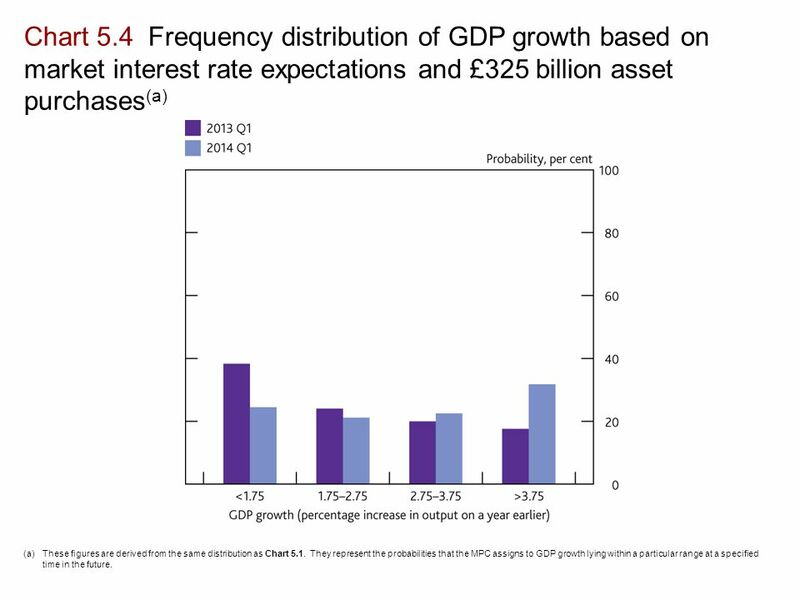 2 Chart 5.1 GDP projection based on market interest rate expectations and £325 billion asset purchases The fan chart depicts the probability of various outcomes for GDP growth. It has been conditioned on the assumption that the stock of purchased assets financed by the issuance of central bank reserves reaches £325 billion and remains there throughout the forecast period. To the left of the first vertical dashed line, the distribution reflects the likelihood of revisions to the data over the past; to the right, it reflects uncertainty over the evolution of GDP growth in the future. If economic circumstances identical to today’s were to prevail on 100 occasions, the MPC’s best collective judgement is that the mature estimate of GDP growth would lie within the darkest central band on only 10 of those occasions. The fan chart is constructed so that outturns are also expected to lie within each pair of the lighter green areas on 10 occasions. In any particular quarter of the forecast period, GDP is therefore expected to lie somewhere within the fan on 90 out of 100 occasions. And on the remaining 10 out of 100 occasions GDP growth can fall anywhere outside the green area of the fan chart. Over the forecast period, this has been depicted by the light grey background. In any quarter of the forecast period, the probability mass in each pair of identically coloured bands sums to 10%. The distribution of that 10% between the bands below and above the central projection varies according to the skew at each quarter, with the distribution given by the ratio of the width of the bands below the central projection to the bands above it. In Chart 5.1, the probabilities in the lower bands are the same as those in the upper bands at Years 1, 2 and 3. See the box on page 39 of the November 2007 Inflation Report for a fuller description of the fan chart and what it represents. The second dashed line is drawn at the two-year point of the projection. 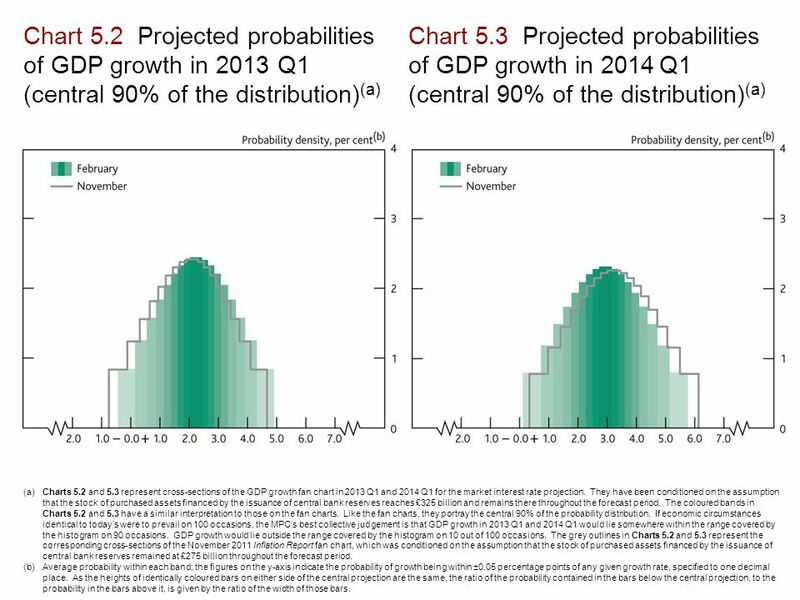 3 Chart 5.2 Projected probabilities of GDP growth in 2013 Q1 (central 90% of the distribution) (a) Chart 5.3 Projected probabilities of GDP growth in 2014 Q1 (central 90% of the distribution) (a) (a)Charts 5.2 and 5.3 represent cross-sections of the GDP growth fan chart in 2013 Q1 and 2014 Q1 for the market interest rate projection. They have been conditioned on the assumption that the stock of purchased assets financed by the issuance of central bank reserves reaches £325 billion and remains there throughout the forecast period. The coloured bands in Charts 5.2 and 5.3 have a similar interpretation to those on the fan charts. Like the fan charts, they portray the central 90% of the probability distribution. If economic circumstances identical to today’s were to prevail on 100 occasions, the MPC’s best collective judgement is that GDP growth in 2013 Q1 and 2014 Q1 would lie somewhere within the range covered by the histogram on 90 occasions. GDP growth would lie outside the range covered by the histogram on 10 out of 100 occasions. The grey outlines in Charts 5.2 and 5.3 represent the corresponding cross-sections of the November 2011 Inflation Report fan chart, which was conditioned on the assumption that the stock of purchased assets financed by the issuance of central bank reserves remained at £275 billion throughout the forecast period. (b)Average probability within each band; the figures on the y-axis indicate the probability of growth being within ±0.05 percentage points of any given growth rate, specified to one decimal place. As the heights of identically coloured bars on either side of the central projection are the same, the ratio of the probability contained in the bars below the central projection, to the probability in the bars above it, is given by the ratio of the width of those bars. 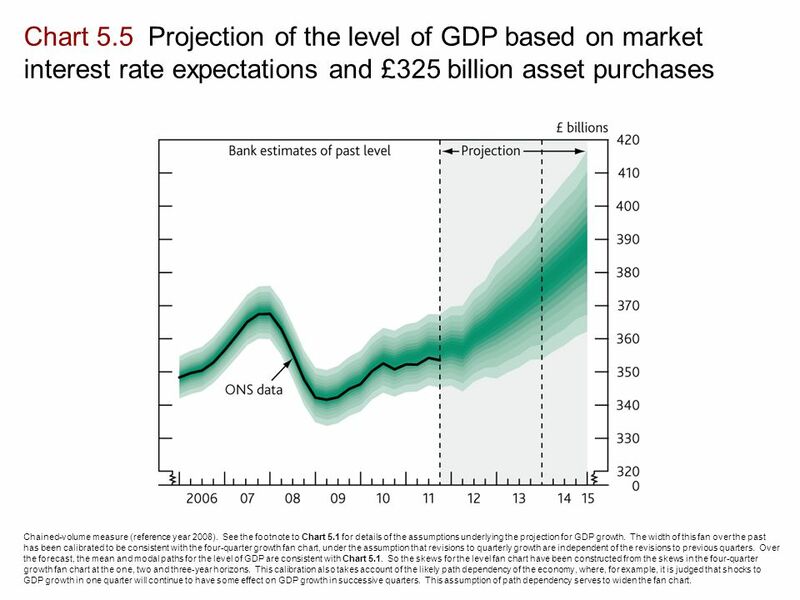 5 Chart 5.5 Projection of the level of GDP based on market interest rate expectations and £325 billion asset purchases Chained-volume measure (reference year 2008). See the footnote to Chart 5.1 for details of the assumptions underlying the projection for GDP growth. The width of this fan over the past has been calibrated to be consistent with the four-quarter growth fan chart, under the assumption that revisions to quarterly growth are independent of the revisions to previous quarters. Over the forecast, the mean and modal paths for the level of GDP are consistent with Chart 5.1. So the skews for the level fan chart have been constructed from the skews in the four-quarter growth fan chart at the one, two and three-year horizons. This calibration also takes account of the likely path dependency of the economy, where, for example, it is judged that shocks to GDP growth in one quarter will continue to have some effect on GDP growth in successive quarters. This assumption of path dependency serves to widen the fan chart. 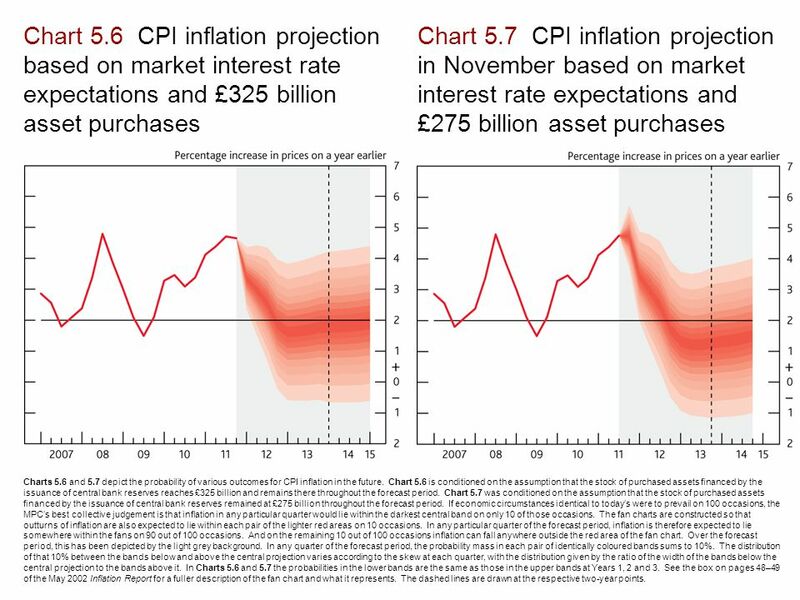 6 Chart 5.6 CPI inflation projection based on market interest rate expectations and £325 billion asset purchases Chart 5.7 CPI inflation projection in November based on market interest rate expectations and £275 billion asset purchases Charts 5.6 and 5.7 depict the probability of various outcomes for CPI inflation in the future. Chart 5.6 is conditioned on the assumption that the stock of purchased assets financed by the issuance of central bank reserves reaches £325 billion and remains there throughout the forecast period. Chart 5.7 was conditioned on the assumption that the stock of purchased assets financed by the issuance of central bank reserves remained at £275 billion throughout the forecast period. If economic circumstances identical to today’s were to prevail on 100 occasions, the MPC’s best collective judgement is that inflation in any particular quarter would lie within the darkest central band on only 10 of those occasions. The fan charts are constructed so that outturns of inflation are also expected to lie within each pair of the lighter red areas on 10 occasions. 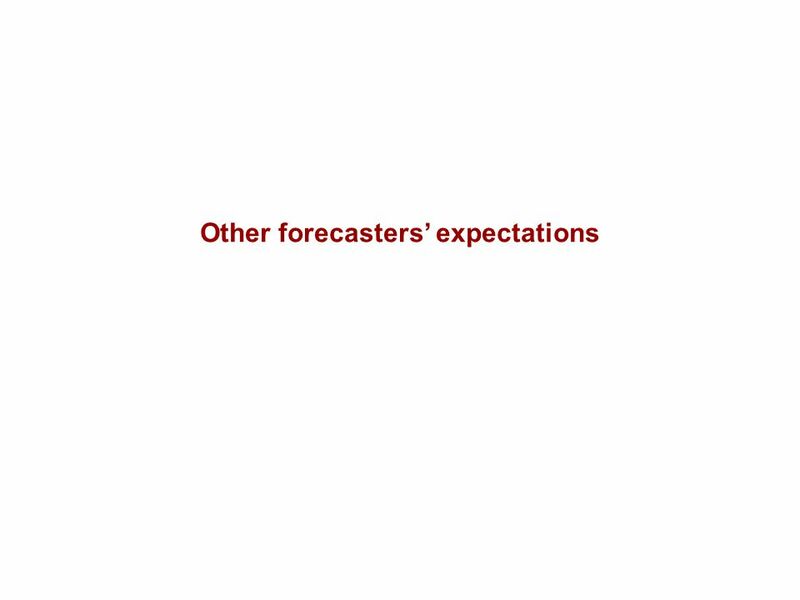 In any particular quarter of the forecast period, inflation is therefore expected to lie somewhere within the fans on 90 out of 100 occasions. And on the remaining 10 out of 100 occasions inflation can fall anywhere outside the red area of the fan chart. Over the forecast period, this has been depicted by the light grey background. In any quarter of the forecast period, the probability mass in each pair of identically coloured bands sums to 10%. The distribution of that 10% between the bands below and above the central projection varies according to the skew at each quarter, with the distribution given by the ratio of the width of the bands below the central projection to the bands above it. In Charts 5.6 and 5.7 the probabilities in the lower bands are the same as those in the upper bands at Years 1, 2 and 3. 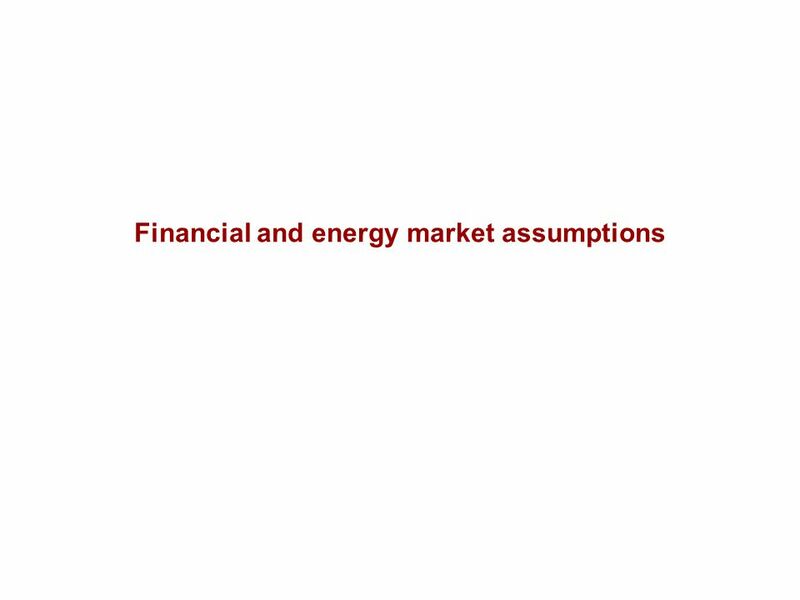 See the box on pages 48–49 of the May 2002 Inflation Report for a fuller description of the fan chart and what it represents. The dashed lines are drawn at the respective two-year points. 7 Chart 5.8 An indicator of the probability that inflation will be above the target The February and November swathes in this chart are derived from the same distributions as Charts 5.6 and 5.7 respectively. 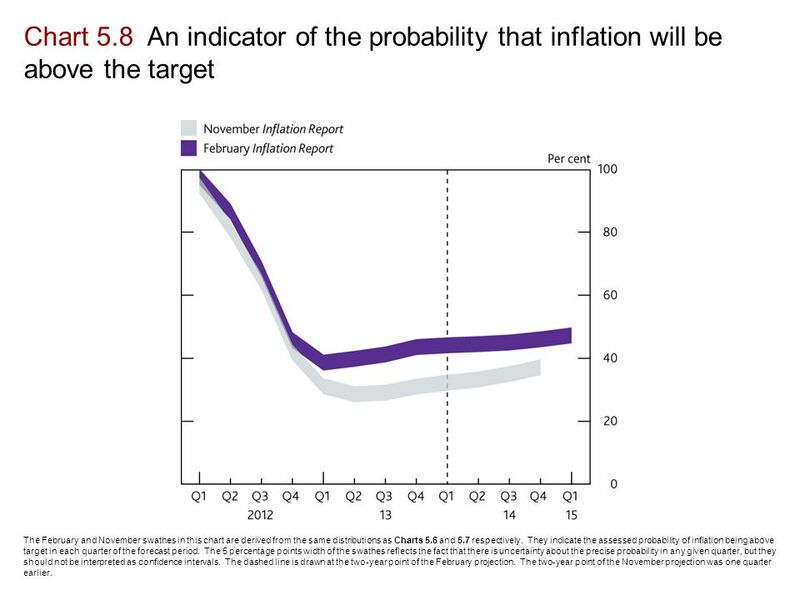 They indicate the assessed probability of inflation being above target in each quarter of the forecast period. The 5 percentage points width of the swathes reflects the fact that there is uncertainty about the precise probability in any given quarter, but they should not be interpreted as confidence intervals. The dashed line is drawn at the two-year point of the February projection. The two-year point of the November projection was one quarter earlier. 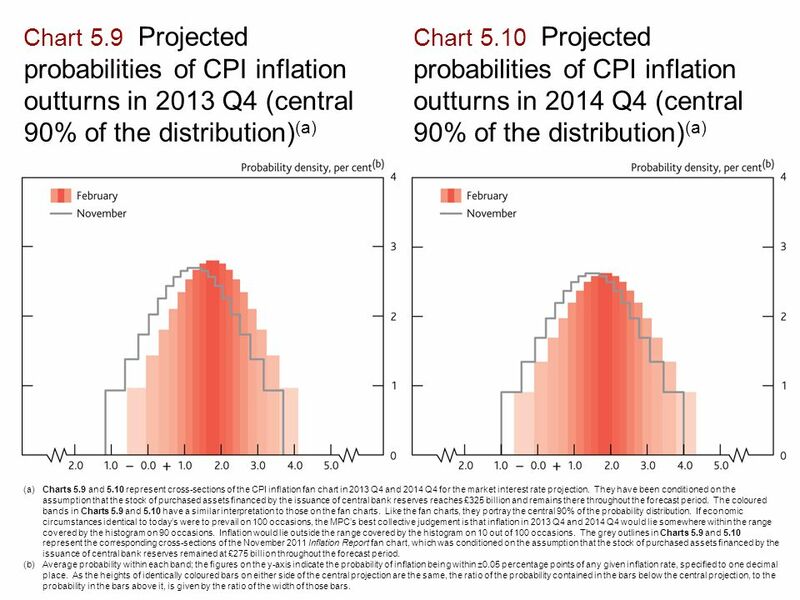 8 Chart 5.9 Projected probabilities of CPI inflation outturns in 2013 Q4 (central 90% of the distribution) (a) Chart 5.10 Projected probabilities of CPI inflation outturns in 2014 Q4 (central 90% of the distribution) (a) (a)Charts 5.9 and 5.10 represent cross-sections of the CPI inflation fan chart in 2013 Q4 and 2014 Q4 for the market interest rate projection. They have been conditioned on the assumption that the stock of purchased assets financed by the issuance of central bank reserves reaches £325 billion and remains there throughout the forecast period. The coloured bands in Charts 5.9 and 5.10 have a similar interpretation to those on the fan charts. Like the fan charts, they portray the central 90% of the probability distribution. If economic circumstances identical to today’s were to prevail on 100 occasions, the MPC’s best collective judgement is that inflation in 2013 Q4 and 2014 Q4 would lie somewhere within the range covered by the histogram on 90 occasions. Inflation would lie outside the range covered by the histogram on 10 out of 100 occasions. 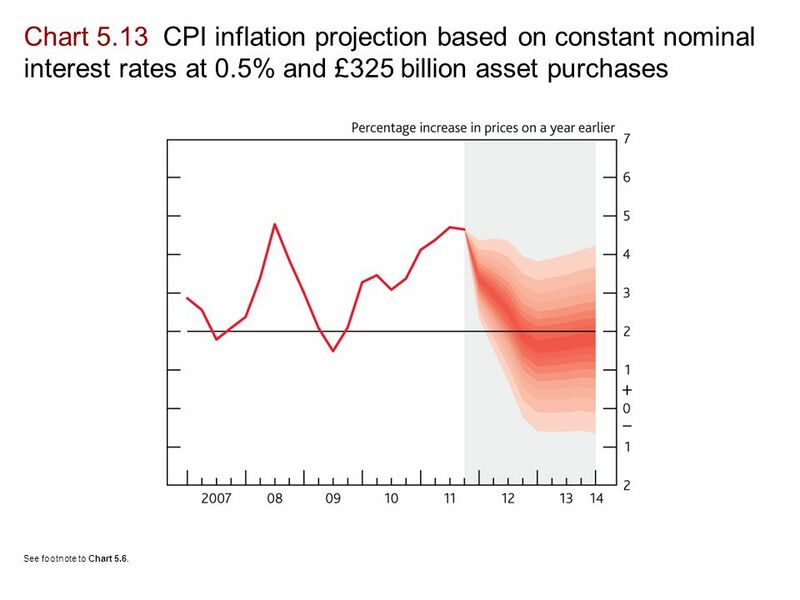 The grey outlines in Charts 5.9 and 5.10 represent the corresponding cross-sections of the November 2011 Inflation Report fan chart, which was conditioned on the assumption that the stock of purchased assets financed by the issuance of central bank reserves remained at £275 billion throughout the forecast period. (b)Average probability within each band; the figures on the y-axis indicate the probability of inflation being within ±0.05 percentage points of any given inflation rate, specified to one decimal place. As the heights of identically coloured bars on either side of the central projection are the same, the ratio of the probability contained in the bars below the central projection, to the probability in the bars above it, is given by the ratio of the width of those bars. 10 Chart 5.12 GDP projection based on constant nominal interest rates at 0.5% and £325 billion asset purchases See footnote to Chart 5.1. 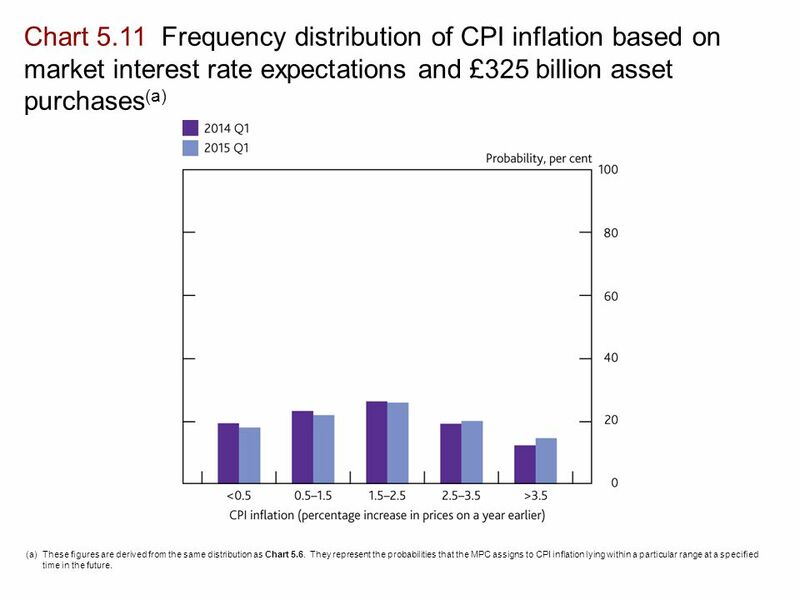 11 Chart 5.13 CPI inflation projection based on constant nominal interest rates at 0.5% and £325 billion asset purchases See footnote to Chart 5.6. 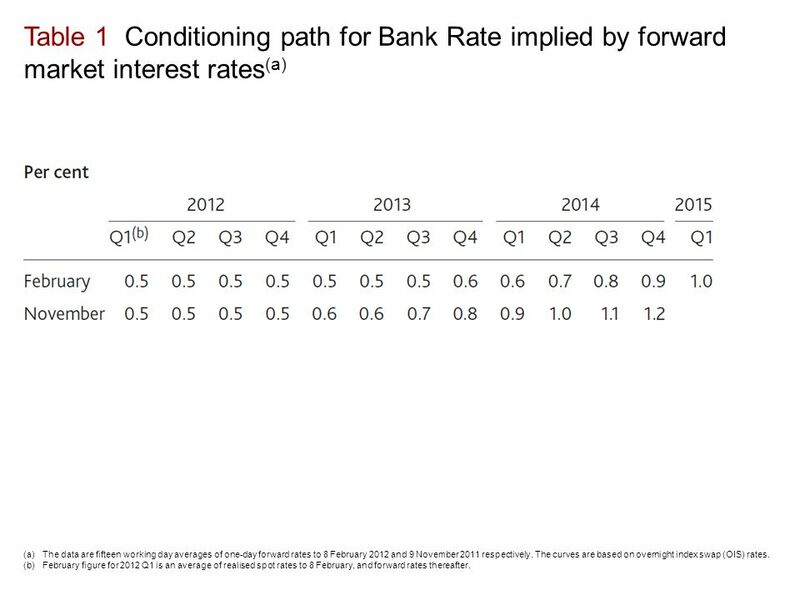 13 Table 1 Conditioning path for Bank Rate implied by forward market interest rates (a) (a)The data are fifteen working day averages of one-day forward rates to 8 February 2012 and 9 November 2011 respectively. The curves are based on overnight index swap (OIS) rates. (b)February figure for 2012 Q1 is an average of realised spot rates to 8 February, and forward rates thereafter. 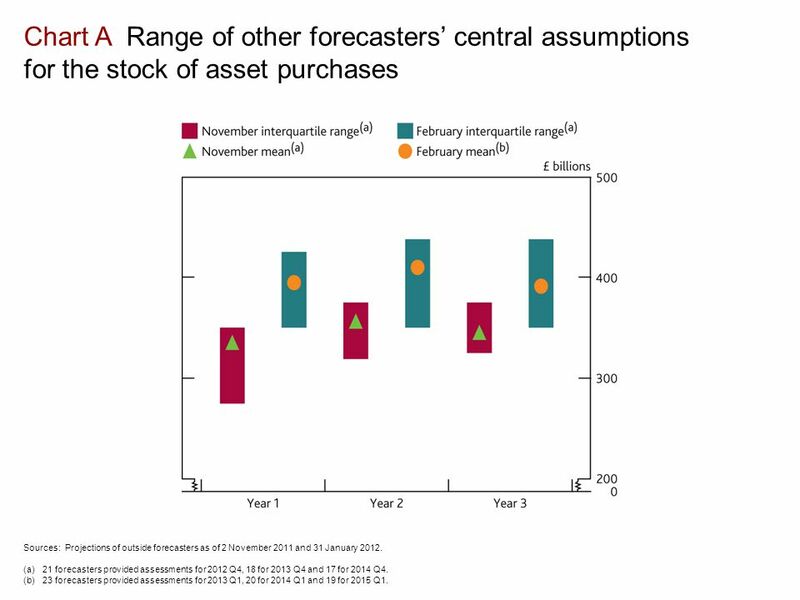 15 Chart A Range of other forecasters’ central assumptions for the stock of asset purchases Sources: Projections of outside forecasters as of 2 November 2011 and 31 January 2012. (a)21 forecasters provided assessments for 2012 Q4, 18 for 2013 Q4 and 17 for 2014 Q4. (b)23 forecasters provided assessments for 2013 Q1, 20 for 2014 Q1 and 19 for 2015 Q1. 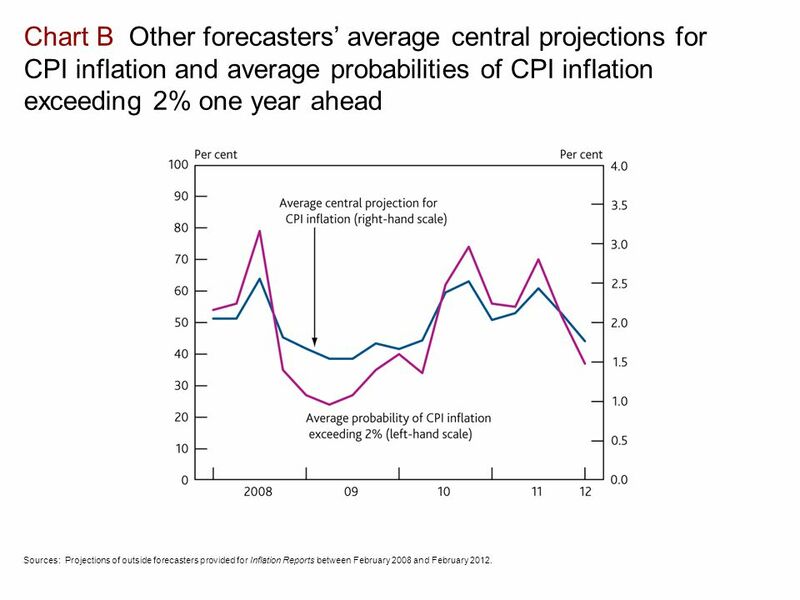 16 Chart B Other forecasters’ average central projections for CPI inflation and average probabilities of CPI inflation exceeding 2% one year ahead Sources: Projections of outside forecasters provided for Inflation Reports between February 2008 and February 2012. 17 Table 1 Averages of other forecasters’ central projections (a) Source: Projections of outside forecasters as of 31 January 2012. (a)For 2013 Q1, there were 25 forecasts for CPI inflation, GDP growth and Bank Rate, 23 for the stock of purchased assets and 18 for the sterling ERI. For 2014 Q1, there were 22 forecasts for CPI inflation and GDP growth, 23 for Bank Rate, 20 for the stock of purchased assets and 15 for the sterling ERI. 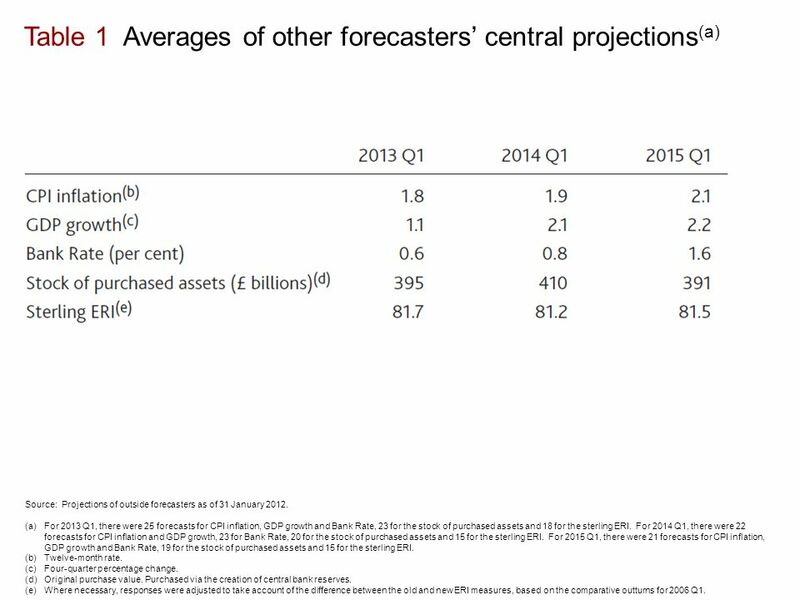 For 2015 Q1, there were 21 forecasts for CPI inflation, GDP growth and Bank Rate, 19 for the stock of purchased assets and 15 for the sterling ERI. (b)Twelve-month rate. (c)Four-quarter percentage change. (d)Original purchase value. Purchased via the creation of central bank reserves. (e)Where necessary, responses were adjusted to take account of the difference between the old and new ERI measures, based on the comparative outturns for 2006 Q1. 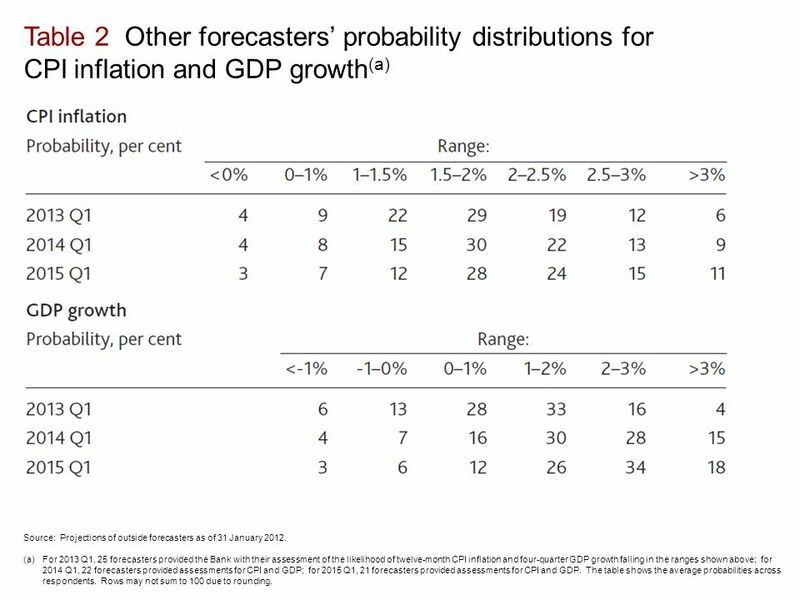 18 Table 2 Other forecasters’ probability distributions for CPI inflation and GDP growth (a) Source: Projections of outside forecasters as of 31 January 2012. (a)For 2013 Q1, 25 forecasters provided the Bank with their assessment of the likelihood of twelve-month CPI inflation and four-quarter GDP growth falling in the ranges shown above; for 2014 Q1, 22 forecasters provided assessments for CPI and GDP; for 2015 Q1, 21 forecasters provided assessments for CPI and GDP. The table shows the average probabilities across respondents. Rows may not sum to 100 due to rounding. Download ppt "Inflation Report February 2012 Prospects for inflation." Inflation Report November 2013 Prospects for inflation. Inflation Report May 2014 Overview. 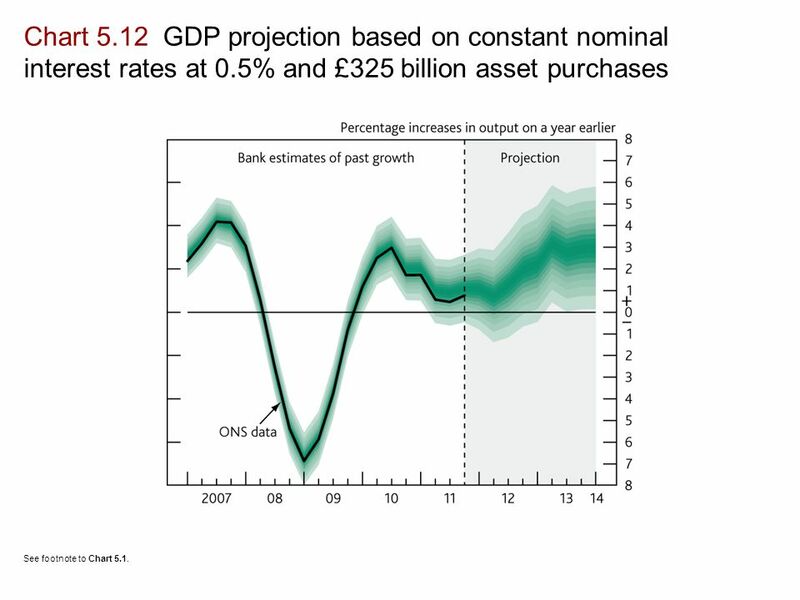 Chart 1 GDP projection based on market interest rate expectations and £375 billion purchased assets The fan chart. Inflation Report February 2014 Costs and prices. Chart 4.1 Contributions to CPI inflation (a) (a) Quarterly contributions to annual CPI inflation. Data. Inflation Report August 2013 Demand. Chart 2.1 Contributions to four-quarter growth in nominal GDP (a) (a)At market prices. Contributions may not sum. Inflation Report February 2015 Output and supply. Inflation Report November 2014 Output and supply. Inflation Report February Overview Chart 1 GDP projection based on market interest rate expectations and £200 billion asset purchases The fan chart. Inflation Report February 2015 Prospects for inflation. Inflation Report May 2014 Output and supply. Chart 3.1 GDP and sectoral output (a) (a)Chained-volume measures. GDP is at market prices. Indices of sectoral. Inflation Report November 2014 Prospects for inflation. Inflation Report May 2013 Overview. Chart 1 GDP projection based on market interest rate expectations and £375 billion asset purchases The fan chart depicts. Inflation Report February 2014 Overview. Chart 1 GDP projection based on market interest rate expectations and £375 billion purchased assets The fan chart. Inflation Report May 2015 Prospects for inflation. Inflation Report May 2015 Overview. 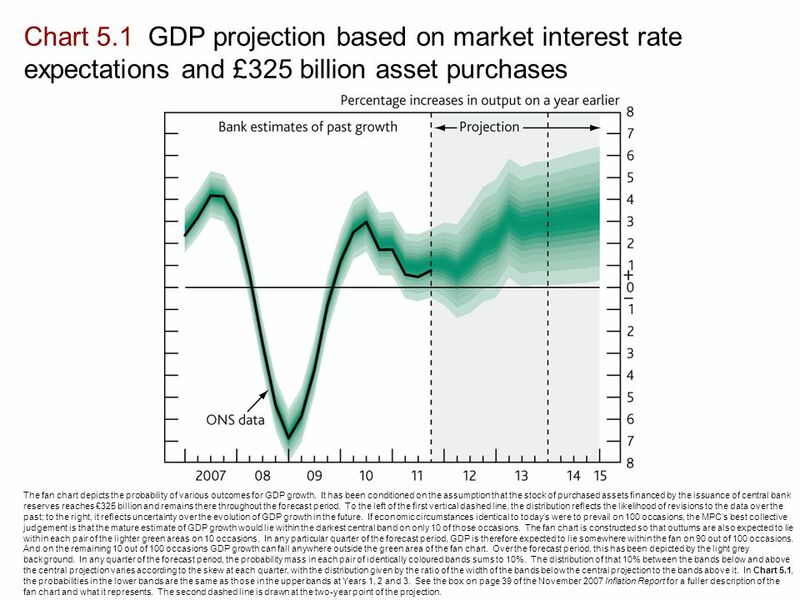 Chart 1 GDP projection based on market interest rate expectations and £375 billion purchased assets The fan chart. Inflation Report February 2015 Money and asset prices. Inflation Report August 2014 Prospects for inflation. Monetary Policy Chapter 13, 14. Inflation Report May 2014 Prospects for inflation. Inflation Report February 2014 Prospects for inflation. Inflation Report February 2012 Costs and prices. Chart 4.1 Contributions to CPI inflation (a) (a) Contributions to annual CPI inflation. Data are non.